The MINI Cooper S is a car with a lot of history. The original Mini was an economy compact that was introduced by the British Motor Corporation in 1959 and survived several corporate changes until the Mini was finally discontinued in 2000. In 2001, the MINI, now under control of the German auto manufacturer BMW, was released to the public. The new car is considered a spiritual successor to its predecessor, though not really a technical one. The Cooper S performance versions of both the Mini and MINI, were released in 1963 and in 2001, respectively. The Mini was developed to be the United Kingdom’s answer to the Volkswagen Beetle. It featured a low starting price and, despite its very small size, a lot of useable space. During its original tenure, it was manufactured in many countries around the world, and several different versions were developed and sold over the years alongside the Mini and the Mini Cooper S. The Cooper nameplate came from John Cooper, who owned the Cooper Car Company and designed Formula One cars. The first Mini Cooper got a significant engine upgrade, a sport-oriented transmission and front disc brakes, all carefully designed to extract better performance from the small car. The Mini Cooper S was developed alongside the Mini Cooper, and featured a more powerful engine with higher performance tuning as well as updated brakes. The Mini Cooper S gained accolades and recognition for winning the Monte Carlo Rally for several years in the 1960s, helping cement the car’s status as a British cultural icon. When the original Mini went out of production in 2000, BMW was ready to ramp it up with the new version, capitalizing on both the classic car’s cultural significance and BMW’s expertise in engineering and marketing modern premium small cars. It featured a front-wheel-drive configuration for simplicity, and the base versions were thoughtfully designed yet somewhat spartan, with modest engines and comfortable, unglamorous interiors. MINI was capitalized to distinguish the new car from the original, though the Cooper and Cooper S badges are obvious nods to the car’s heritage and those models’ emphasis on performance. The car had been in development since 1995, a design and engineering collaboration between Rover Group in England and BMW in Germany. Rover Group wanted to keep the new MINI true to its economy car heritage; BMW fought to make the car a strong competitor in the premium sport compact market. Rover Group and BMW parted ways in 2000, just in time to put the car into production in a BMW plant in Oxford, England, and control the worldwide launch of the MINI. In many of the car’s global markets, the MINI Cooper S was immediately introduced as the high performance counterpart of the MINI. It became instantly recognizable both for its distinctive hood scoop and its unique exhaust note that came courtesy of its supercharger. The MINI Cooper S also features twin exhaust tips visible under the center of the rear valance, whereas the MINI has only one exhaust tip. 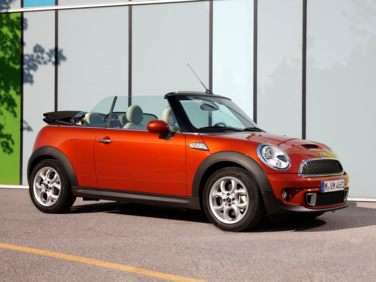 In 2005, the soft-top convertible was offered in both MINI and MINI Cooper S variations. The second generation of the MINI, still in production, was introduced in 2006. The Cooper S retained its signature hood scoop, although significant changes in the engine bay made the scoop a mostly aesthetic touch. The intercooler was relocated across the engine bay and the previous generation’s supercharger was replaced with a twin scroll turbocharger, which yielded improvements in both performance and fuel economy. Additionally, every body panel on the car was changed, even though the car’s styling was a direct evolution from before. The second generation MINI still offers buyers a choice of an automatic or a six-speed manual transmission.